Disclosure: Resilience offered me a complimentary product in exchange for a review. As always all thoughts and opinions are my own. Please contact a healthcare professional before using CBD oil. All sources for information are provided in my post! Lately I have been reading and hearing a lot about CBD oil or cannabidiol oil. 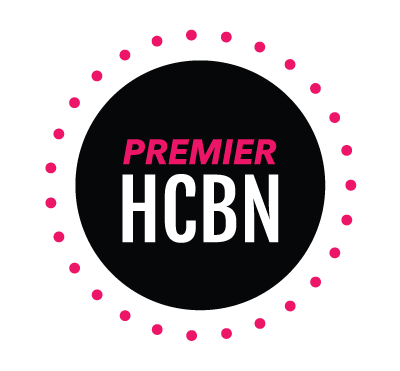 It has been popping up as a recovery method for athletes as well as an all-natural way to manage pain and anxiety. 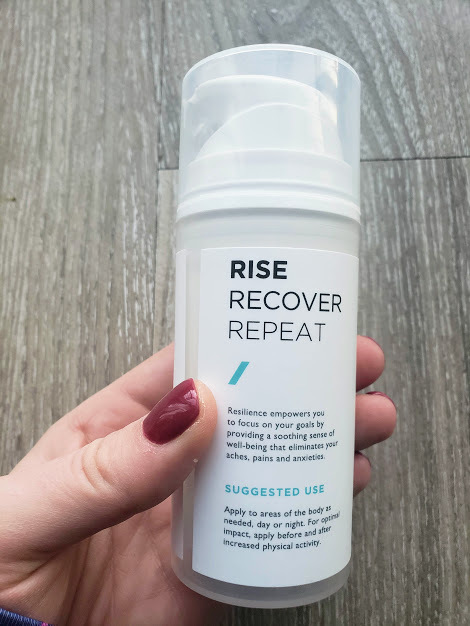 I had the opportunity to try a CBD cream from Resilience CBD which was exciting after being intrigued by CBD’s potential uses in healthcare as a whole but also particularly for running recovery. I am willing to try anything to help make my calves feel less tight and sore! Resilience CBD was founded by military veterans and athletes plus their products are also derived from organic hemp grown in the U.S. and are third-party lab tested which made me trust their quality. Their products also contain no pesticides, herbicides, or harsh chemicals. Scroll to the bottom of the post for a discount code from Resilience. Cannabidiol is one of over 100 cannabinoids found in cannabis (yup, marijuana). CBD products boosts the endocannabinoid system that is a signaling pathway controlling functions in systems through the body. It has similar effects as marijuana including anti-inflammatory and pain-relieving without the high you’d get from medical marijuana. CBD is NOT psychoactive like tetrahydrocannabinol (THC) in marijuana (Source). Most commercially available CBD products use industrial hemp, or a cannabis plant that doesn’t contain more than 0.3% THC. Marijuana and hemp are federally classified as Schedule 1 drugs. Currently Idaho, North Dakota, Nebraska, and Kansas are the only states with no-CBD laws. Literally yesterday the Farm Bill was passed which legalizes hemp. This means you will be seeing a lot more CBD and hemp products. Prior to the passing of the Farm Bill, United States hemp-derived CBD sales totaled estimated $190 million in 2017 (Source). For athletes, the World Anti-Doping Agency removed CBD from the list of prohibited substances in 2017 which has grown the use of CBD in sports. CBD oil I have seen is on the expensive side right now so hopefully this bill makes things more accessible and brings the price down. For example Resilience CBD body lotion costs $85 and their full spectrum CBD oil costs $50-90 for one bottle which is comparable to other brands I have seen. How do you use CBD products? CBD products including tinctures, capsules, and topical formulas such as creams. Currently there are no studies on recommended dosages so you need to be careful and definitely start with a smaller dose and slowly increasing until you feel benefits. 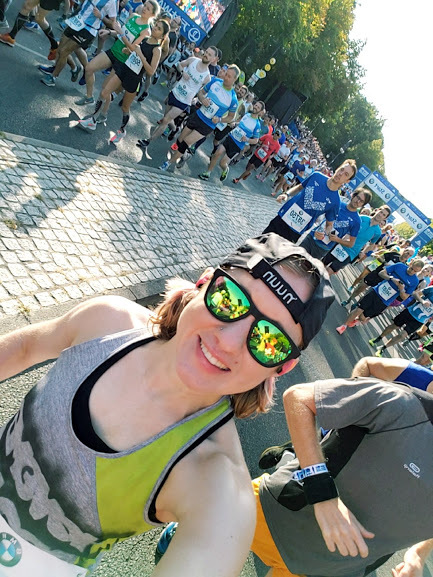 Even in this Runner’s World article, various individuals quote different amounts for CBD newbies starting with as little as 5-15 mg (approximately a few drops of a CBD tincture) or a baseline of 25 milligram for gels. What should you look for when purchasing CBD products? Products also range in potency and amounts of CBD so be sure to know what you are using or taking. One study published in the Journal of the American Medical Association in 2017 found that 70% of all CBD products were inaccurately labelled which 43% of products tested containing more CBD than indicated and 26% containing less. I did my research prior to agreeing to try Resilience CBD and was happy to find out that Resilience CBD third-party lab tests every batch of product through an independent party to ensure purity and quality of their products. They also share their lab results AND the date they were submitted right there on their website. From what I’ve read since there is trace amounts ofTHC in industrial hemp it is very unlikely that CBD would show up on a drug test because most drug test panels are looking for THC and its metabolites. However if you are drug tested it may be better to be safe than sorry and ensure you are getting for 0% THC you can purchase Resilience Isolate, a CBD isolate tincture. What are the claimed benefits of CBD? 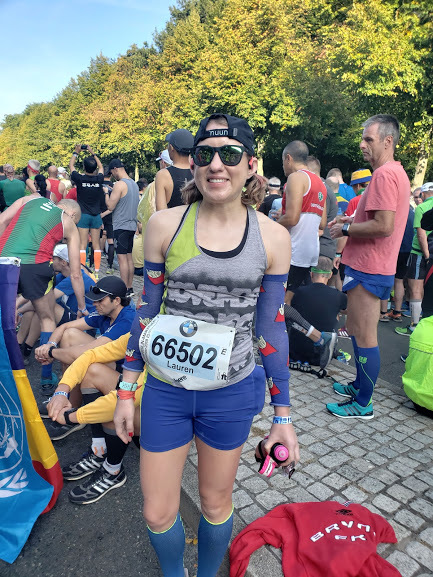 CBD works through the endocannabinoid system which “controls many physiological processes, including food intake and energy balance, learning and memory, and pain processing, to name a few,” says DiPatrizio in this Runner’s World article. As a former chemist and now a evidence-based health care professional, I am always looking to research to support claims. Currently I have not found any studies on CBD and runners specifically. Upon doing a quick literature search I was surprised to see range of ailments that CBD was being studied with including depression, major psychiatric disorders, epilepsy, Parkinson disease, PTSD, sleep disorders, and even asthma. This literature review from September 2018 concluded that studies up to the present show CBD has anxiolytic (anxiety-reducing! ), anti psychotic, and neuroprotective properties. 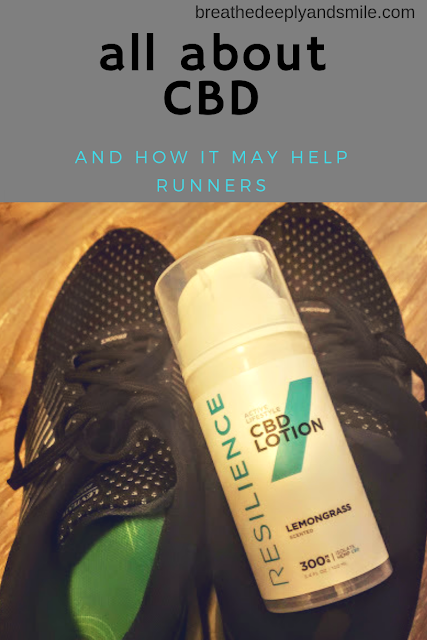 How can CBD help runners? CBD has also has anti-inflammatory benefits which would be the ones sore and achy runners would benefit from. A 2015 study in mice determined CBD application provided therapeutic potential for relief from arthritis pain and inflammation. To get scientific on you again, when you run or workout you create micro-tears in your muscles and tissue. When those micro-tears happen, your body sends in your immune system to the damaged area with inflammatory cells, a.k.a things that make you feel sore and achy (Source). 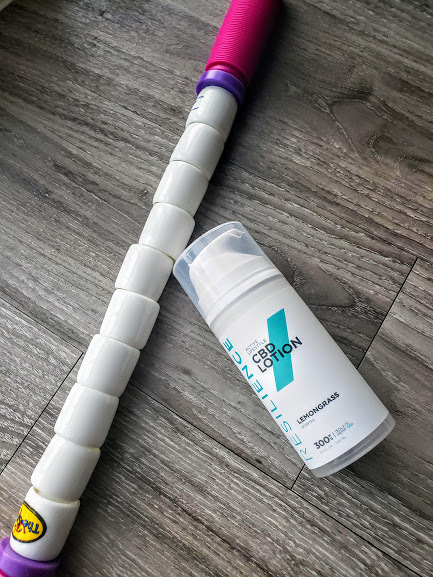 I tested out the Resilience CBD body lotion. I chose it over the CBD sports cream because I thought the lemongrass scent would be more pleasant than smelling like a peppermint or dealing with the icy hot feeling since I planned on slathering it all over my lower legs. The body lotion contains 300 mg of CBD and also contains shea butter, aloe vera, and coconut oil for some moisturizing with my recovery. The directions note to use consistently to areas of body as needed including before and after activity. I used for one week just at bedtime and then used for 2 more weeks applying morning and night. The lemongrass scent is really pleasant and isn’t overpowering. 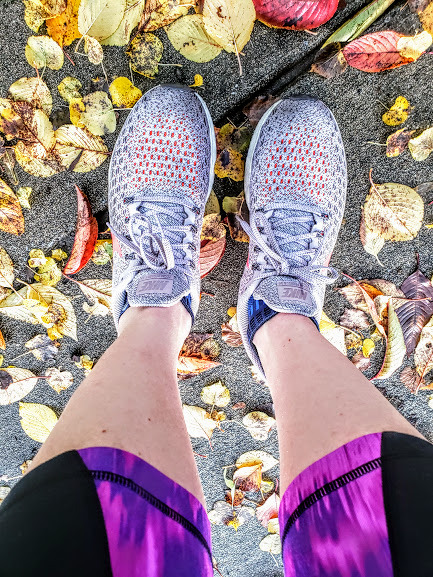 My calves are also severely tight and despite not running and then slowly running just a little bit after the 50K I ran at the end of November, I couldn’t seem to shake the extra tightness in my calves and lower legs. I was also dealing with some ankle discomfort on my left leg so I was applying the cream there too. Overall I did feel less tight and achy, and now my ankle discomfort has gone away. To be totally honest, it could be a placebo effect or due to other factors including more time, trying to stretch my calves more, but it could be the CBD. It was relaxing and also provided a nice reminder to take some time for myself at the end of the day with my nightly ritual of applying the lotion to my legs. In the future I would love to try CBD oil to see if I experience benefits from it, particularly with some of my overall tension and anxiety. Overall if you are dealing with pain or sore muscles, I suggest adding CBD to your recovery arsenal. Again be sure to do your research and be aware of your dosage as well as talk to a health care professional! Resilience has more information on CBD in general and their products on their website. Have you ever tried CBD products? Have you heard of CBD oil? Disclosure: This gift guide is not sponsored. Any ambassadorships or complimentary products are mentioned. As always all thoughts and opinions are my own. I know, another gift guide. So original. However maybe like me, all the things you bought during the Black Friday/Cyber Monday weekend were for yourself, and now you actually need to buy gifts for others. I actually have bought or want to buy most of the items in this gift guide! I've compiled some of my favorite gift ideas for your friends or family members with a health and fitness theme. That could be a runner/gym rat/yogi or maybe someone who has a fitness goal for 2019. Inspire someone! I've kept things under $30 because I usually am not spending much more on gifts, besides for my boyfriend. Based on some of these gift guides I've seen, people spend more on gifts or have some nice loved ones, right?! Cheers to the holiday season and keeping things fun, stress-free, and festive! I have been eyeing up buying this tumbler for myself!! This cute travel wine tumbler is the perfect gift for the runner or wine-lover in your life! It's stainless steel and double-walled so it provides perfect insulation. It also comes in three bright colors. It is definitely something that is perfect for all year round. These are also available in store at Charm City Run in Locust Point if you want to shop small AND shop local in Baltimore. I received a complimentary Kudos Coaster Plus to review and liked it so much I'm including it as great gift! It's a customizable display coaster with six colored inserts that allows you to showcase race medals or any other favorite memory of the year such as artwork and photos. 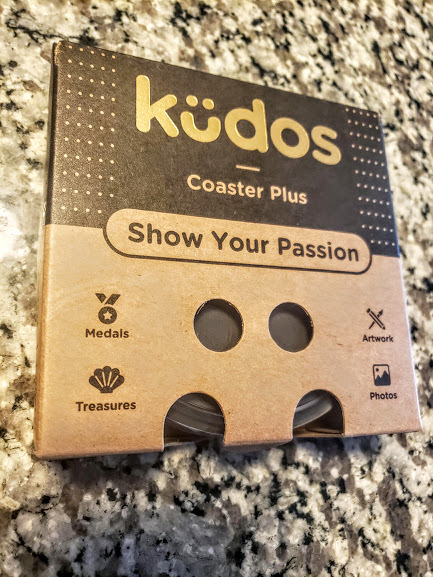 You pop open the coaster, add your treasure, add in enough inserts to make it flush with the top including the colored insert you want displayed on top, and then simply pop the top back on. Right now I'm displaying my favorite medal of the year which I get to see every time I have a drink. 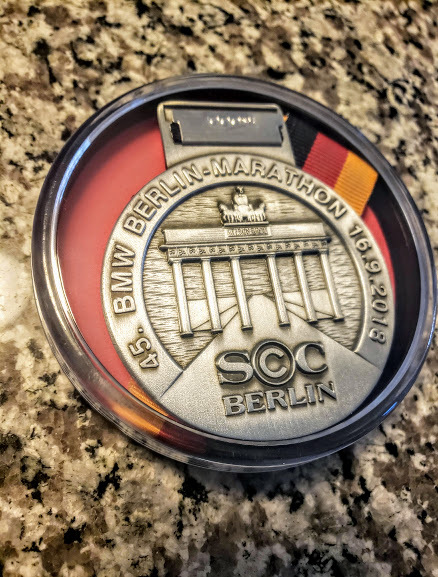 I like it because you could give it to a friend to display a race medal or just pop in a photo or inspirational quote to make it a personalized gift! For any friend, gift them a top with an inspirational saying or quote. For your favorite boss babe, I love this Boss Tank top from Adidas along with some other empowering female shirts on their website. I was asked to check out their website, which I had not been on since buying some Boston Marathon gear earlier this year. I think a top with a motivational quote is a great way to inspire a loved one for the new year as well as gift them some apparel to work towards their goals in. I'm a big fan of mantras and inspirational quotes all over including on my jewelry and written in my planner so why not on a shirt staring back at ya in the mirror? 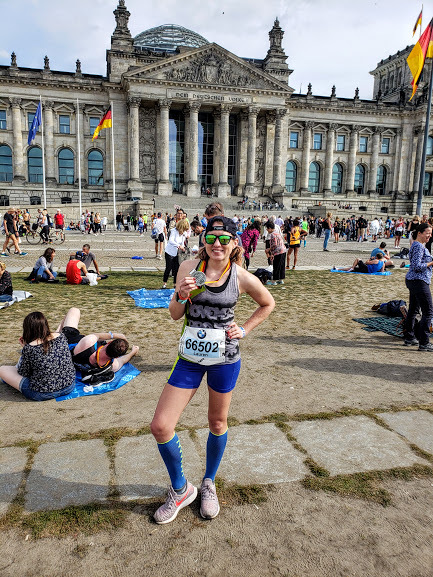 I'm a big fan and ambassador for Lily Trotters compression socks, but they really are a great gift for the runners and fit friends in your life as well as anyone who spends most of the day on their feet such as healthcare professionals. They are even great for anyone travelling this holiday to keep the blood flowing during long flights or car rides. Lily Trotters compression socks provide support as well as keep your legs and toes warm all season. These limited edition holiday socks are green, white, and red making them oh so festive for the season. I told you I loved mantras and inspirational quotes! 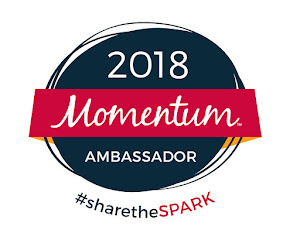 I seem to always mention Momentum Jewelry as gift idea because it fits so many occasions, not just because I've been an ambassador for them for years. They are beautiful, unique, and customizable gifts perfect for that person that inspires you in your life. I love the look of the copper motivate wrap which looks stunning! 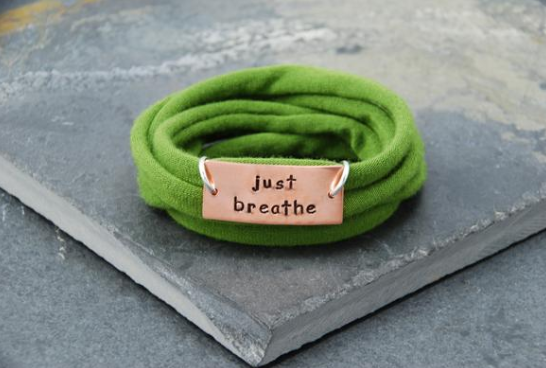 You can choose from one of the options for an inspiring phrase or customize with your own special phrase. I've gifted one of the motivate wraps to a friend running her first marathon as well as my sister with a Disney-themed phrase on it so these truly are a gift that can be for so many different people! BOCO gear makes my favorite hats, including their technical truckers for runner which I am obsessed with. I recently purchased a BOCO gear Pom Pom beanie from Charm City Run (they customize hats for brands & businesses) and besides getting so many compliments on it, it is SO warm and comfortable! 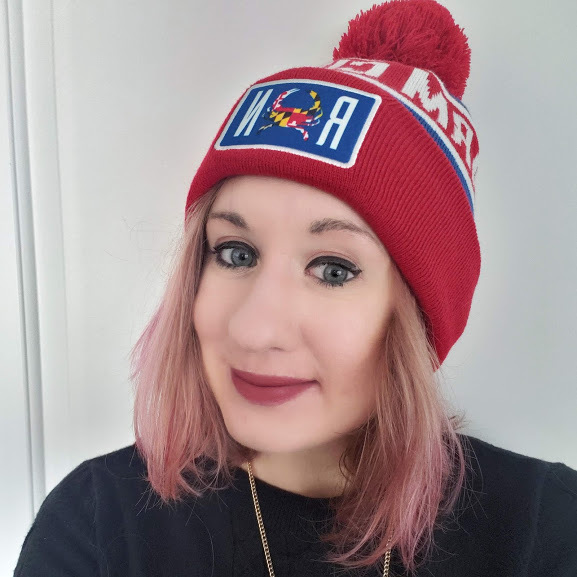 This fair isle beanie is perfect for winter weather or this chunky knit beanie is a more chic-looking option. Either way the beanie is a quality hat for any outdoor activity making it a great holiday gift. Once I saw these in my email, I was smitten with these marathon Christmas ornaments from Run Ink. 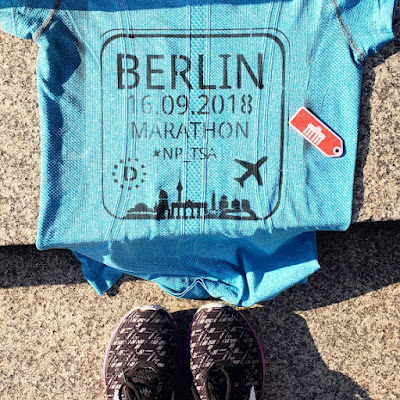 I have a Run Ink customized race map with my PR from the 2016 Chicago Marathon and just ordered myself a smaller Berlin Marathon print to hang up next to it. 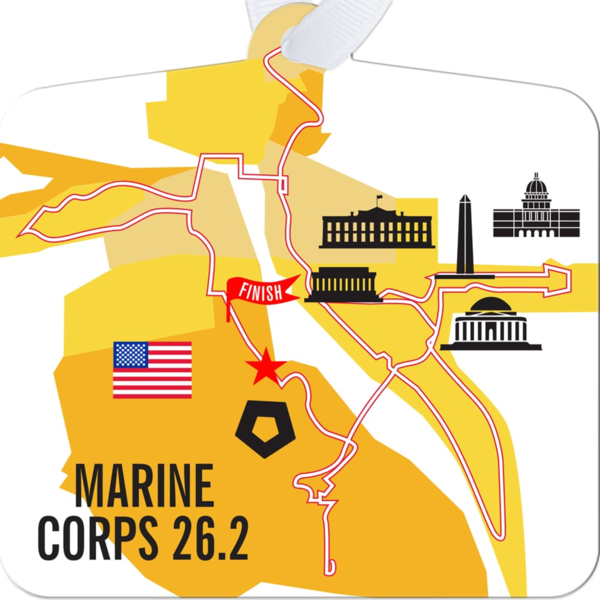 They are unique and beautiful reminders of races.These ornaments are the perfect gifts for the marathon runner in your life who has completed or is dreaming of the six World Marathon Majors or the Marine Corps Marathon. For $4 more there are versions of the ornaments that can be customized to include a race finisher's time which makes for a really special gift that can be hung on the recipient's tree each year. Be sure to note that the last day to order for Christmas delivery is 12/9! Sparkly Soul headbands are my favorite way to add a little sparkle to my workout outfit. And also distract from my tired eyes and sweaty face, ya know. They are elastic all the way around and do stay on my head. There are a ton of widths, designs, and colors to match the personality of your gift recipient. My favorite are the sparkly thin headbands including the pictured Sugar Plum Thin Sparkle band which is gold and fabulous. There's even fun collections of headbands including bridal, Star Wars, and unicorn headbands! 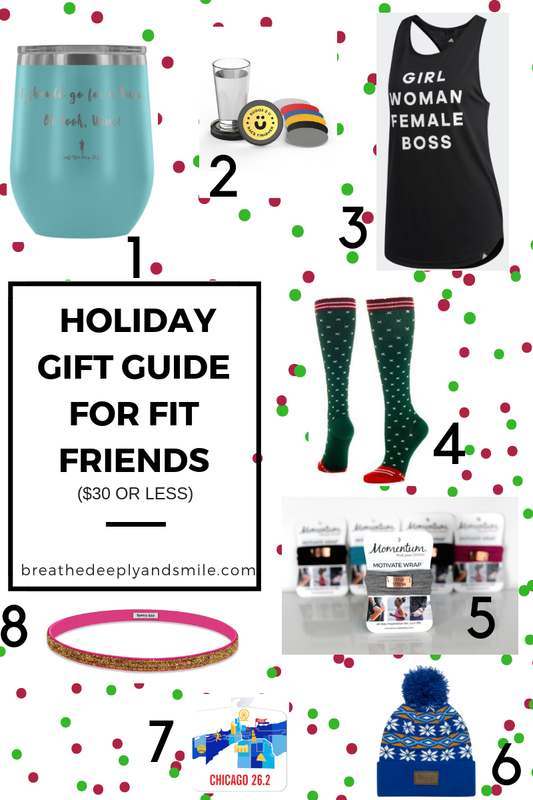 What is your gift idea for a fit friend? Do you have or have you gifted any of these items? Rockay Accelerate Running Socks-The Perfect Combination! 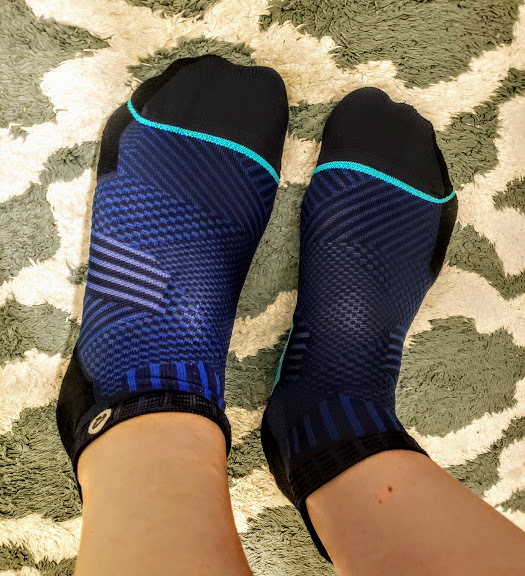 Disclosure: I received a complimentary pair of Rockay running socks to review and share. As always all thoughts and opinions are my own. After getting fitted for a solid pair of running shoes, I always recommend people invest in a few pairs of running socks with the main factor being that they are moisture-wicking. I have enough running socks that I end up wearing my athletic socks for mostly everything. This keeps your feet happy running and helps prevent blisters! 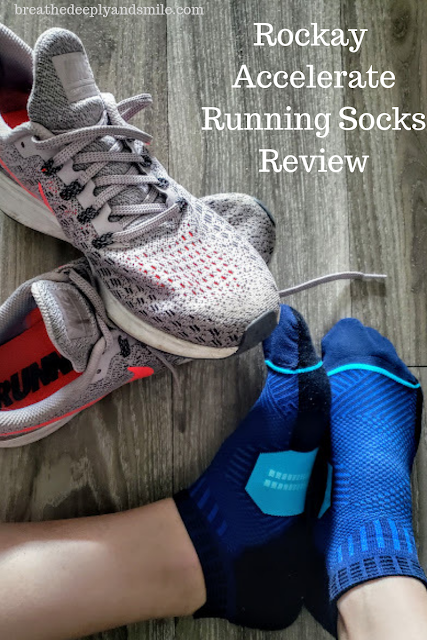 I mainly run in Feetures running socks and some Balega socks but had the opportunity to try out a pair of Rockay Accelerate running socks. 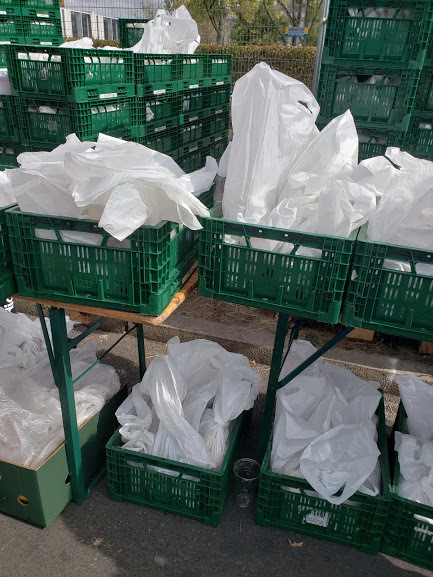 Rockay is a European-based running company focused on being environmentally friendly with a long-term goal of sourcing fabrics that are recyclable and turning plastic into fabric. Rockay sent me the Rockay Accelerate socks in navy blue which retail for $15.95. The Rockay Accelerate socks were super comfortable and perfect for running. Also, I love the way they look with the pattern of fabric plus the blue color combo I was sent (there are 6 different colors). 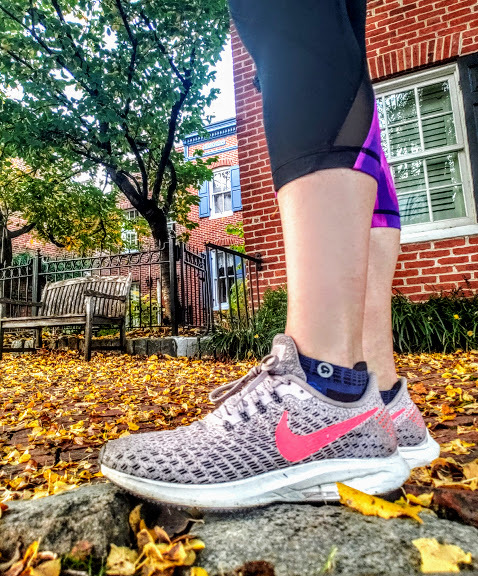 They offer compression around the arch and upper, which felt similar to Feetures running socks but may feel weird if you haven’t worn them before. The compression helps your feet feel supported as well as encourages blood flow. The extra cushion on the heel, toes and forefoot adds extra comfort and more protection. My favorite thing about the Rockay Accelerate socks is the fabrics used. The socks are made from 30% organic Merino wool, 66% Polyamide (similar to polyester), and 4% Elastane. The Elastane is the compression, the Polyamide is on the top of the foot and is light and durable, and the Merino wool allows the socks to be breathable and good at regulating temperatures. Merino wool can be great for warm, cold, and rainy weather conditions. The combo of the Merino wool with the compression helps prevent blisters! The Rockay Accelerate socks also have a LIFETIME guarantee so if they fail or rip you can get a free pair. Feetures and some other brands have this guarantee which is great, especially if you are paying almost $16 for a pair of socks, you want them to last! Because of the compression and temperature regulation qualities, these socks are not only great for running but also for hiking and other outdoor activities. The socks felt really nice and snug on my feet but were also lightweight. The socks have a snug elastic top so they did not shift around or let any dirt in. These are definitely a pair of socks I want to take out on the trails and keep wearing through the winter. I am also happy to support a running gear brand with environmentally-conscious goals! Rockay Accelerate socks can be purchased on Amazon (women and men sizes) or on the Rockay website. What are your favorite running socks? Do you wear your moisture-wicking socks just for running or for other activities? 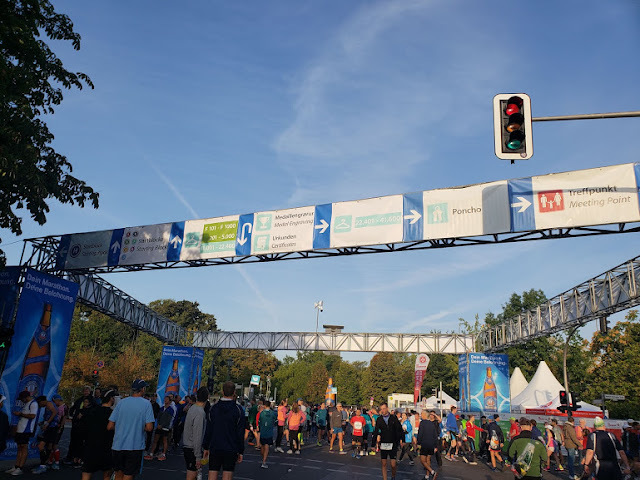 September 16, 2018 I ran the freaking Berlin Marathon! 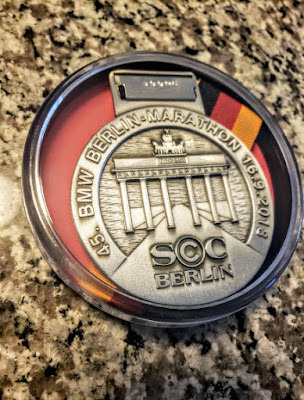 It was my 7th marathon and 3rd World Major Marathon. It was quite the experience! So much on an experience it’s taken me a month and a half to finally get this post live. 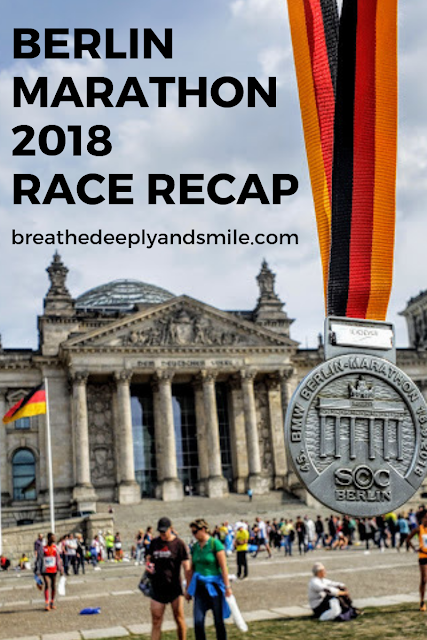 I plan to blog about my time in Germany as well as how I planned for this trip, but let’s just focus on the race for this recap. 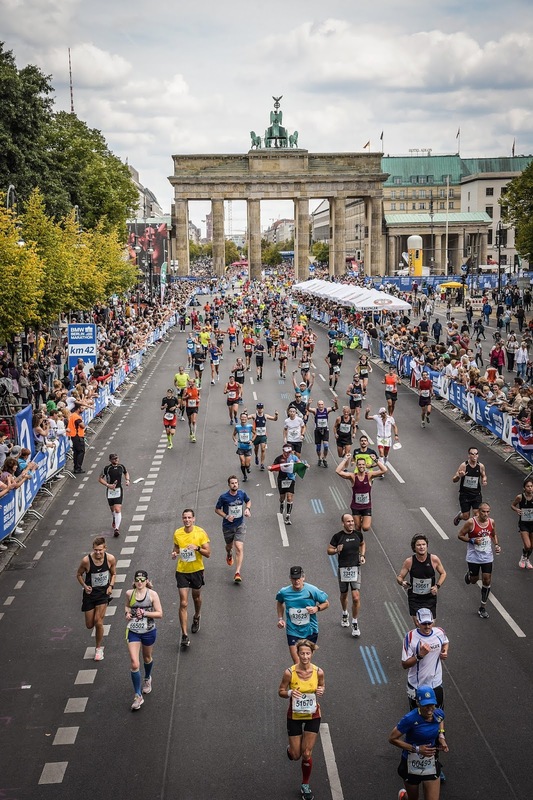 Like many large marathons these days, the Berlin Marathon uses a lottery system. Check out their registration page for information on registering (Registration for the 2019 race ends 11/7/2018)! The entry fee this year was 125€-this does not include a race shirt (you can pre-order one when you register). 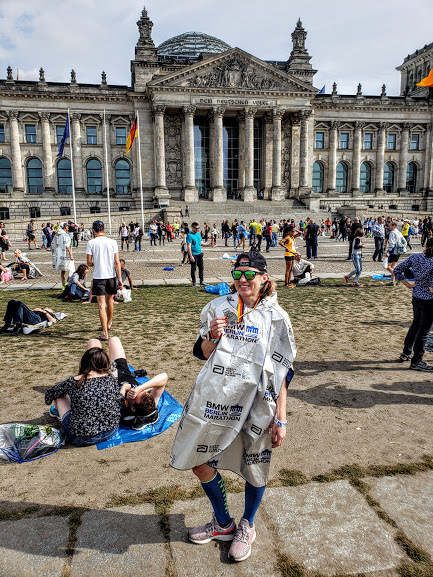 The race also has you choose between a post-race poncho and being able to drop a bag of clothes off for after the race, which is unlike other races I have run. 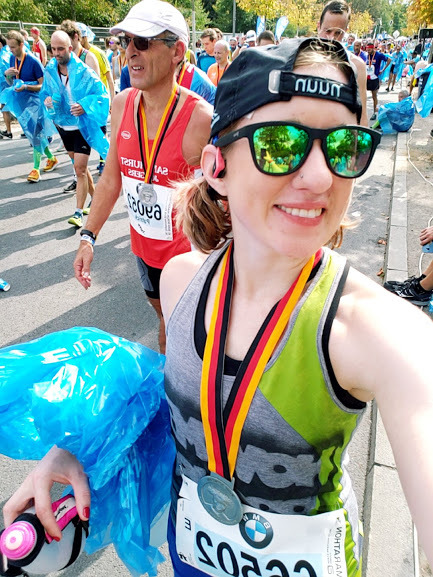 I talked a little bit about my training in recaps one and two-I never got to my final training recap before flying out to Berlin (whoops!). Travel-wise I booked roundtrip flights to Munich. 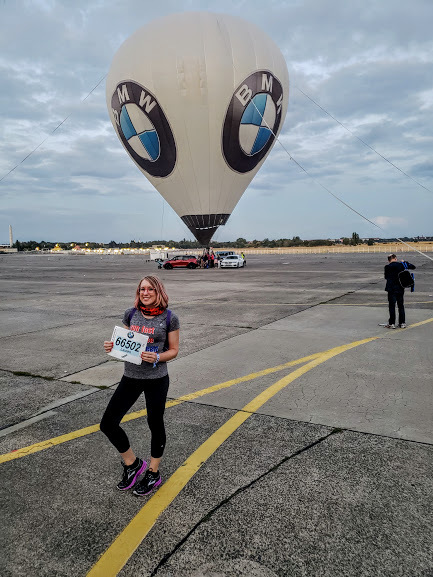 We left Thursday from Baltimore, arrived in Munich technically Friday morning, and caught a small flight from Munich to Berlin later that morning. It was a bit exhausting not flying straight into Berlin. I’d also probably give myself an extra day or two to get acclimated to the time change before an overseas race. 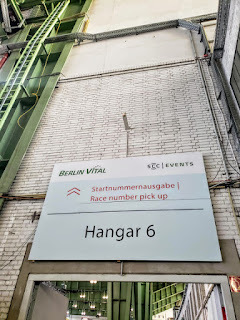 I wanted things to be relaxing so I booked a hotel in the Mitte neighborhood, right near the Alexanderplatz and a train station. The race has over 40,000 runners, and I heard the expo was very crowded Saturday, the day before the race. 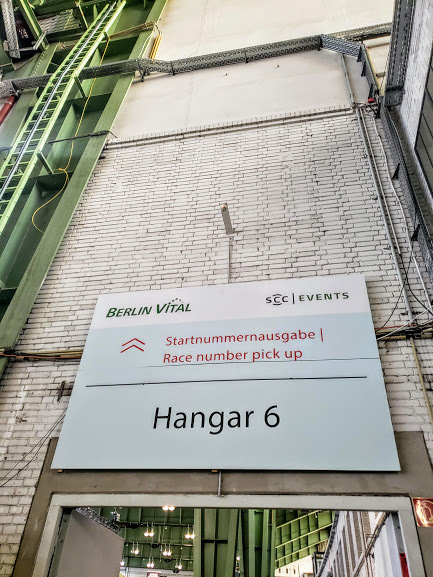 After checking into our hotel and grabbing a bite to eat I headed over to the expo at the old Berlin Tempelhof Airport (the place is huge and has lots of history-one of the 3 iconic European pre-World War II airports!). We got there with just over an hour to spare. 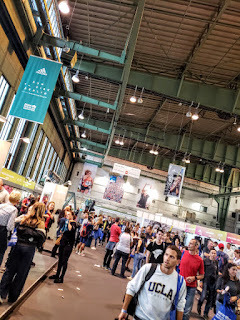 The expo was really crowded and took a bit of time. 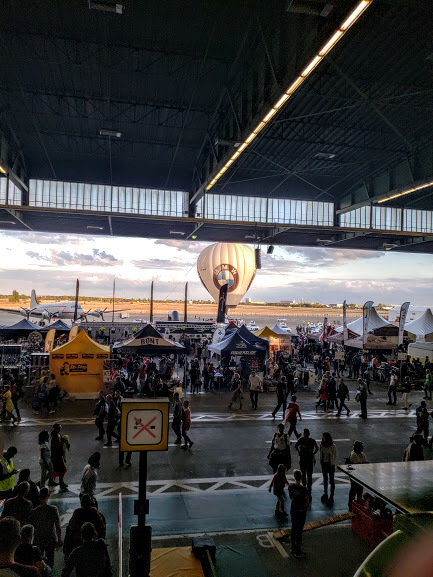 The expo included time outside of the airport as well as two full airport HANGARS before getting to the actual bib pickup in the back. First I showed my bib confirmation and then ID, then received a participant bracelet I needed to get into the expo and race corral. 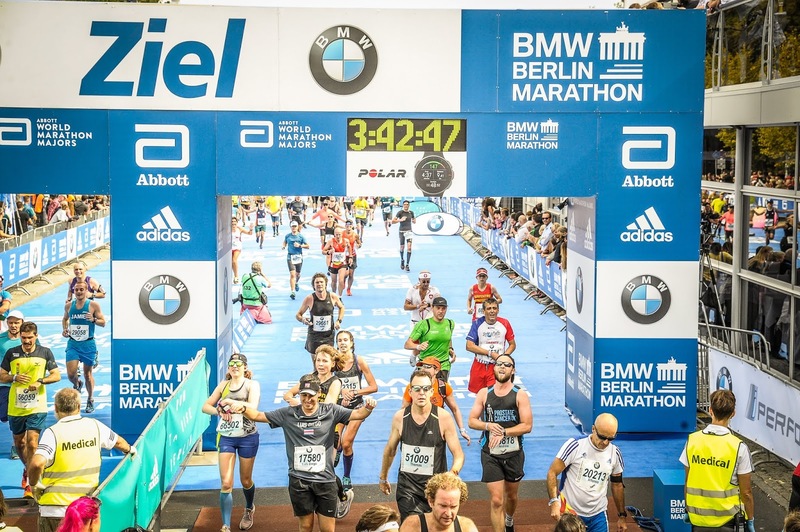 The official gear was by Adidas, and if you have ever raced a World Marathon Major or huge marathon you know it gets crazy crowded plus some things sell out. I picked up my pre-ordered race shirt, and I also bought a race t-shirt (youth sizes for the win!) and hat. There was the 6k Generali Breakfast Run the day before the race that thousands of people participated in. I instead went to a November Project shakeout run. It was fun to meet people from some different tribes as well as see a few friends and of course get a sweet spray-painted tag on my shirt. Later in the day I spent way too much time on my feet walking around and doing some sight-seeing. 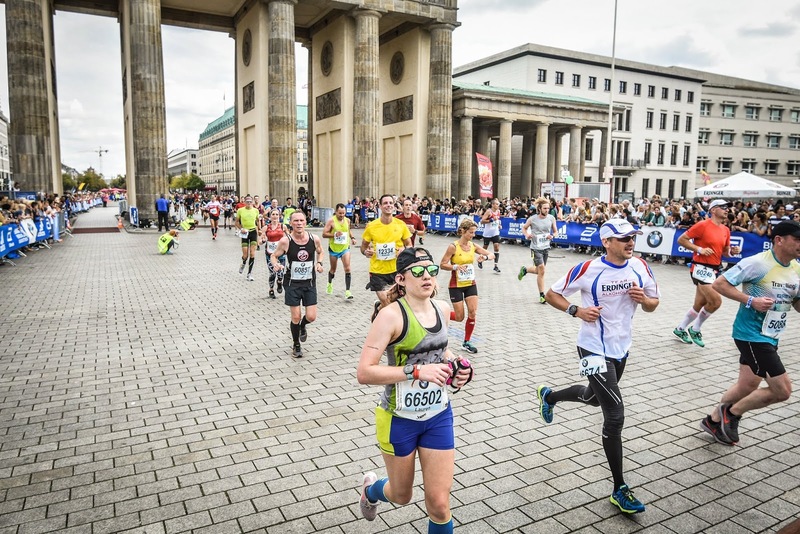 I even spotted some of the Berlin Marathon Inline Skating race which is so unusual. 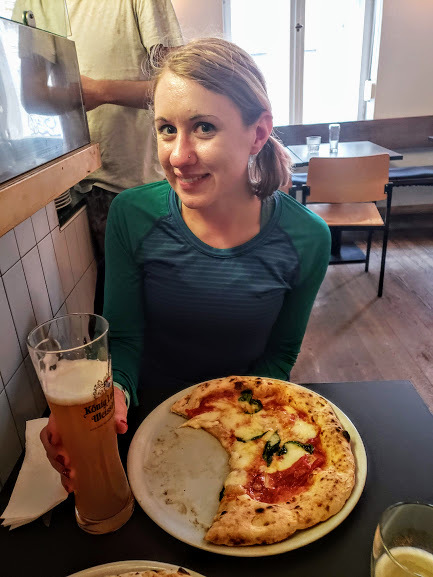 I had pizza the night before the race and an alcohol-free beer. It happened to be a Neapolitan Italian pizza place that was some of the best pizza I've ever had. 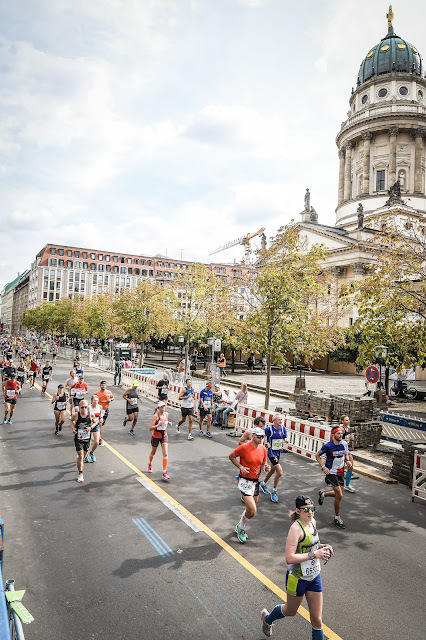 The Berlin Marathon begins later in the morning, just like the Boston Marathon. Wave 1 began at 9:15 AM, but maybe because I was jetlagged it didn’t feel very late in the day. I left myself plenty of time to navigate the pre-race area, but ended up having LOTS of time before the race. 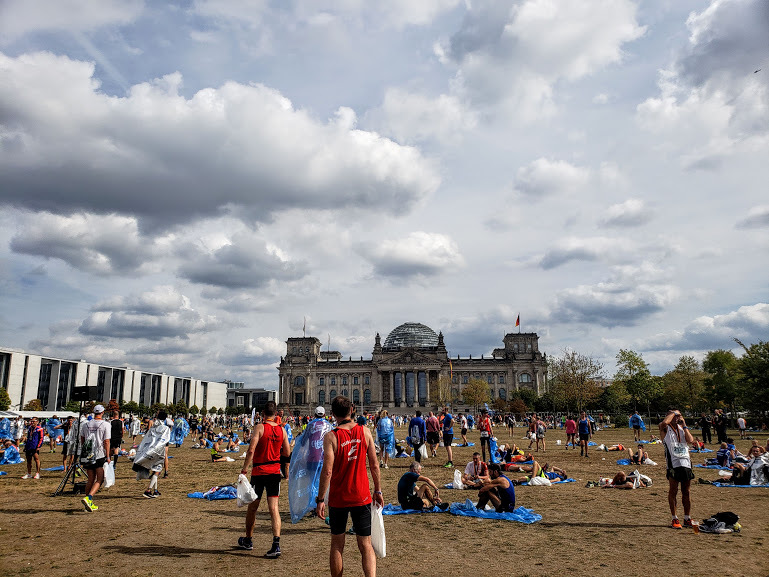 I hopped a train from right by my hotel and then walked right over to the starting area by the Reichstag Building. Bag check around 7:45 AM was very quick to get through. There was a giant field where I hung out. 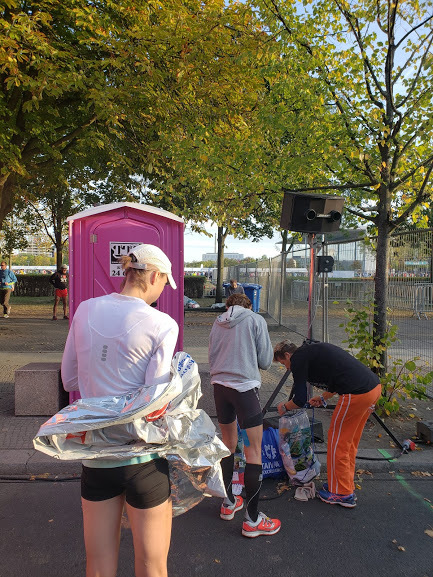 I even found a little port-a-potty with like ONLY 3 people in line as I was walking over to ask someone which way the start corrals were (MARATHON RACE DAY MAGIC!). 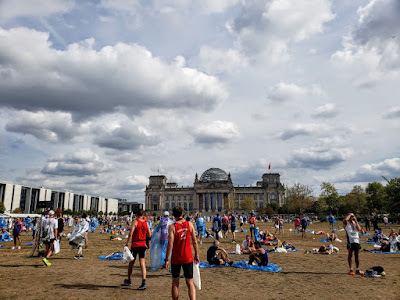 The race area was near the Tiergarten which is like the Central Park of Berlin. It was easy to follow all the signs to bathrooms and the race corrals. I was in the last corral of the first wave. I spent a lot of time just waiting around in the corral. I ended up meeting a woman from the Boston area and another from New York, both who recognized my November Project tagged tank top! 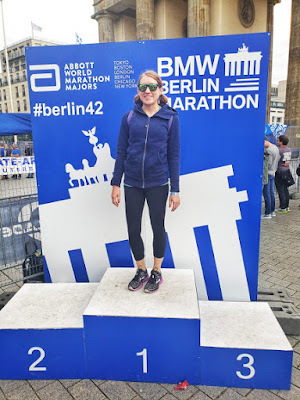 It was truly amazing to be in such an international race surrounded by runners from all different countries, hearing so many different languages around me in the corral. 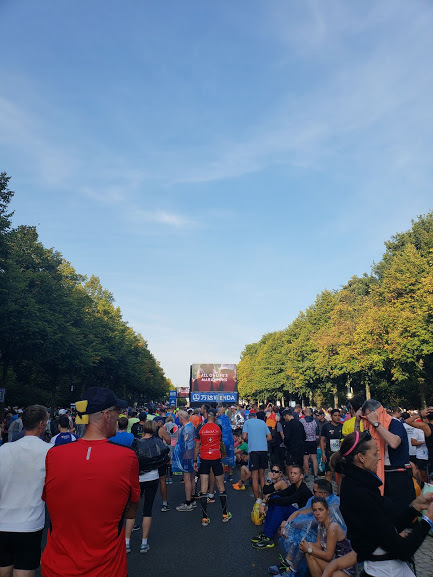 They had a big jumbo screen playing videos with runners speaking about the race in different languages and then played some Shakira song that everybody but me knew. It was also really cool because we could see on the screen when the hand cyclers and elites started. 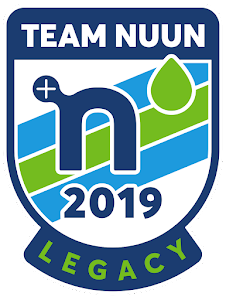 I had planned to fuel with a mixture of Honey Stinger Ginsting gels, Huma Gels, a couple GU gels and carrying Nuun Hydration in a handheld bottle because the on-course nutrition was different from standard Gatorade such as in most big U.S. marathons. The race actually offers the option for us non-elite runners to have bottles of fluid on tables (just like the professional elite runners). There actually wasn't that many bottles on the tables so I probably should have done that! They had iced and hot tea on course which was unique. I had a few cups of the iced tea which was yummy and okay on my stomach. There were also some different sport gels and these things called gel chips that were cola flavored-I had one on my race bag from the expo. It tasted like a cola marshmallow. The electrolyte drink was Beetster which yup, is beetroot plus other extracts like lemon. I love beets and drink beet juice before races, but didn’t want to mess with it during the race. 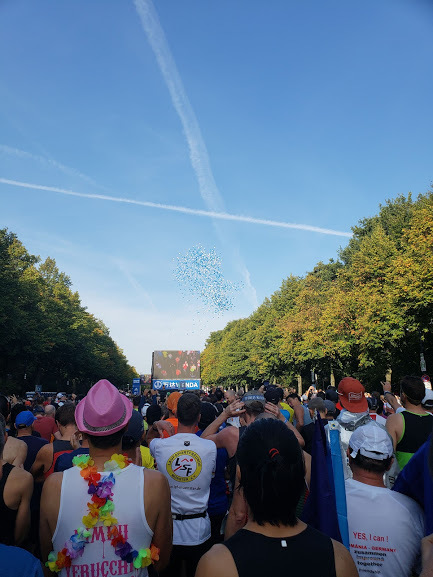 There was a big balloon release at the start of the marathon which was so fun! 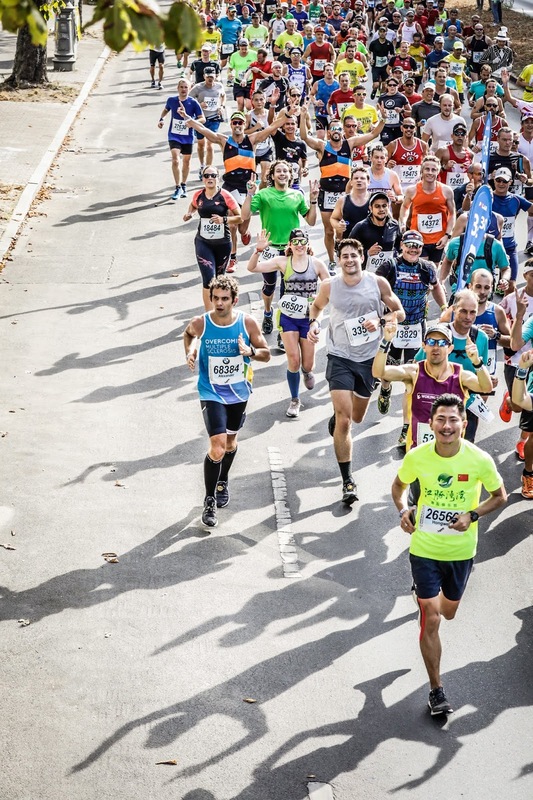 Miles 1-6: The first few miles of a marathon are always exciting. I told myself to settle in and try to not get caught up in all of the runners around me. It was awesome trying to soak it all in. 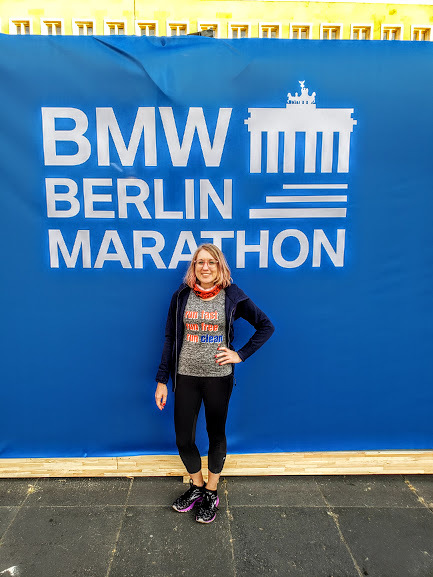 I kept reminding myself that I’m in Germany running the Berlin FREAKING marathon right now! Very quickly I found out the water stops were a mess due to plastic cups (see my overall recap bullet points at the end of the post) so it was hard because I usually follow the squeeze-the-cup drinking method during races. Miles 7-12: Around mile 6 or 7 I found the 3:30 pace group come from behind me and decided to stick with them. With pace groups sometimes I get anxious because there’s a lot of people clustered around them, especially in a big race like this one. I was looking out for my boyfriend around Mile 8 because that’s when we planned he would be able to see me since we weren’t sure how he’d get around the course. I didn’t see him which was honestly a bummer because I thought it was the only time I’d see a familiar spectator face on the course. I was still feeling pretty happy and good during these miles. I didn’t feel as comfortable as I wanted by the halfway mark, but I tried to just focus on sticking with the group and not looking at my watch. 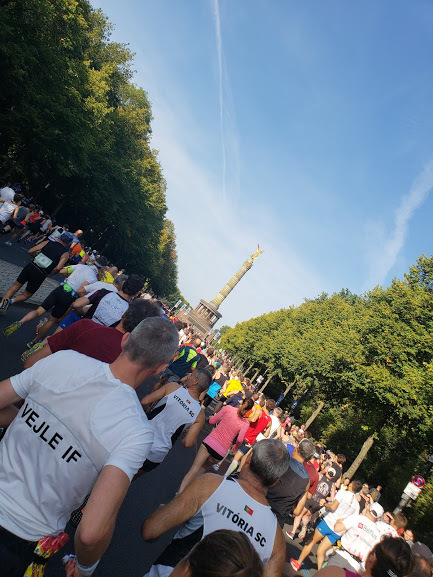 There was plenty of sights to take in and lots of beautiful scenery running around Berlin to distract me from the mileage left to go. Miles 13-18: At this point I was trying to tell myself that I was feeling strong and all was well. Yes, I spent a lot of time during marathons playing mind games with myself! I was running pretty consistent splits which is something I apparently do well during big races (according to my boyfriend who was tracking me and trying to find me). I was trying not to look at my watch really (which I had in miles so no worries about kilometers throwing me off!). I was sticking with the 3:30 pace group and really focusing on just staying with them. There were a few times from 16-18 that I got ahead of them which felt good. I had moments of getting anxious that the group got ahead of me when I slowed down or stopped at water stops plus I like being more near the front of pace groups to avoid the feeling that I’m chasing rather than running with the group. With the later start date plus the warmer-than-usual temperatures in Germany for the race (and my whole trip) I was feeling warmer than I liked. The high for the day ended up being 74 degrees so it was definitely in the 60s by 11 AM- noon. Miles 19-finish: I was not feeling hot for most of these miles. It was probably a combination of the jetlag, it getting warmer out, plus just being at the end of the marathon. My legs were feeling tight, and the pace wasn’t feeling easy. 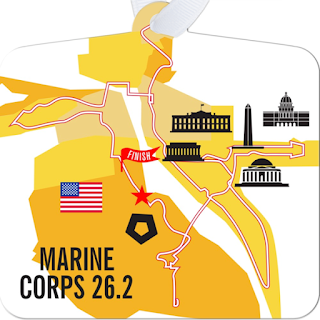 I walked through the water stops and stopped to stretch my calves out at Mile 23. Despite feeling crappy, my pace wasn’t super slowed down. I looked at my watch and saw I could still make it under 3:35, which was my goal for the race so I asked myself “how badly do you want it? Do you want a BQ because you can get it girl”. I decided at Mile 23 I wanted it, and I pushed it to the end. From Mile 21 to the end I focused on just hitting the next mile marker (via my watch, because kilometer markers were obviously more frequent). It was so VERY exciting to run through the famous Brandenburg Gate. I knew that the race finish was past the gate so that last 0.2 ish miles was definitely in the pain cave. 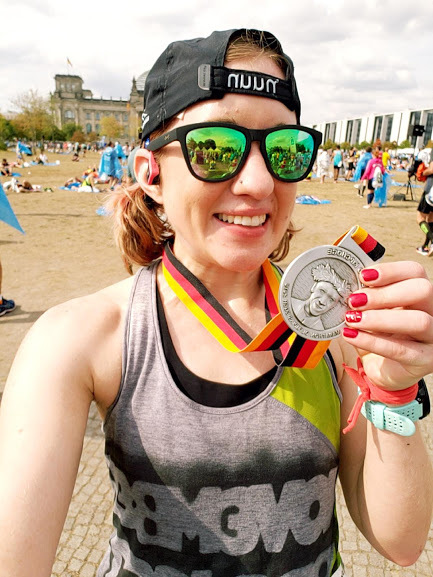 I started crying once I was running through the Brandenburg Gate because I was so happy and grateful to be running my 7th marathon and be in Germany. Crossed the finish line in 3:31: 27. It was my second fastest marathon. I was hoping to have a bigger kick the last 10K to get sub-3:30, but I'm still really happy and proud of this race. I'm happy that I mentally fought through and made the decision to keep pushing when the going got tough. Smile and stop the Garmin! Once I finished I had my obligatory my-legs-are-on-fire-I-feel-nauseous crouch down followed by the usual volunteer telling me to “keep moving along”. I got a water and my bag of snacks (ALL BIG RACES should bag snacks so I don’t have to carry everything!). Since I had opted for the poncho instead of dropping clothes off, I got my nice thick Berlin poncho. 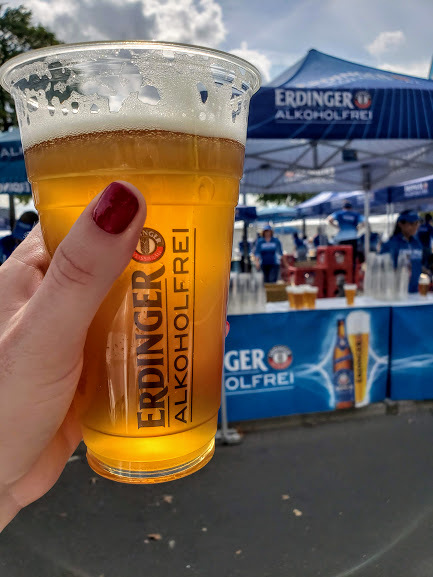 Despite being freaking Germany, land of beer, there is alcohol-free beer for runners at the finish line. 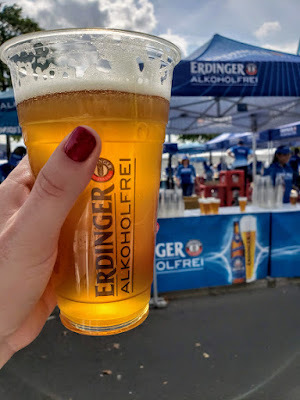 I partook in it because German alcohol-free beer isn’t actually so bad, plus electrolytes and all the good recovery things minus the alcohol. Don’t worry, a real deal alcohol-filled beer was in my future. My boyfriend and I had gotten German SIM cards for our phones so we were able to call/text to meet up together by the Reichstag building. My last text message to him actually didn’t go through because there were so many people using cell phones! 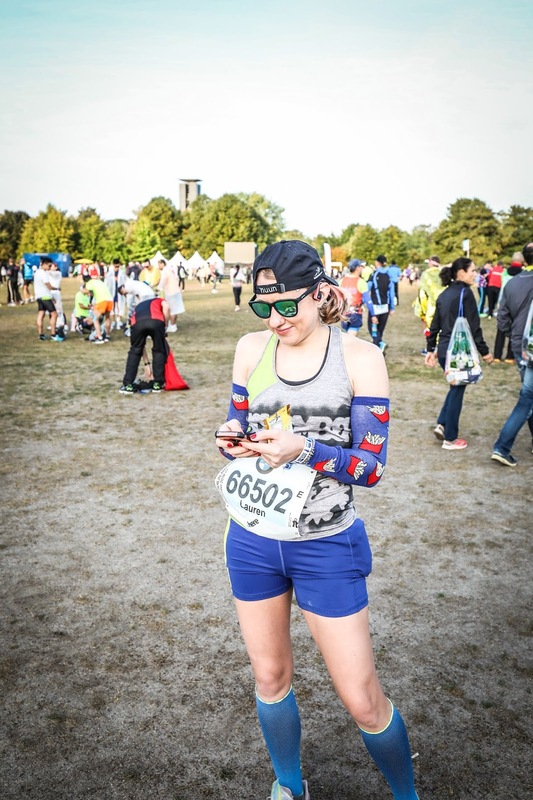 When I found my boyfriend he was helping a runner from Italy use his phone to call who he was supposed to meet up with-see so much fun international runner love! Once I found out Kipchoge set the world marathon record today, it was SO MUCH COOLER that his face was on the back of the medal! I slowly walked back to our hotel to shower and change before having beers and schnitzel. 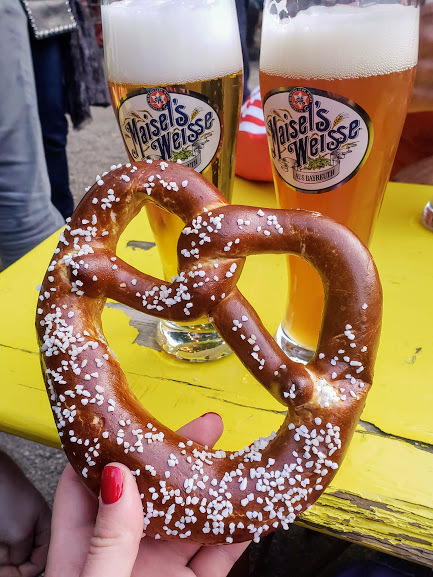 I spent the evening outdoors at a Berlin beer garden with some of my new November Project friends, a.k.a. the perfect post-Berlin Marathon evening. 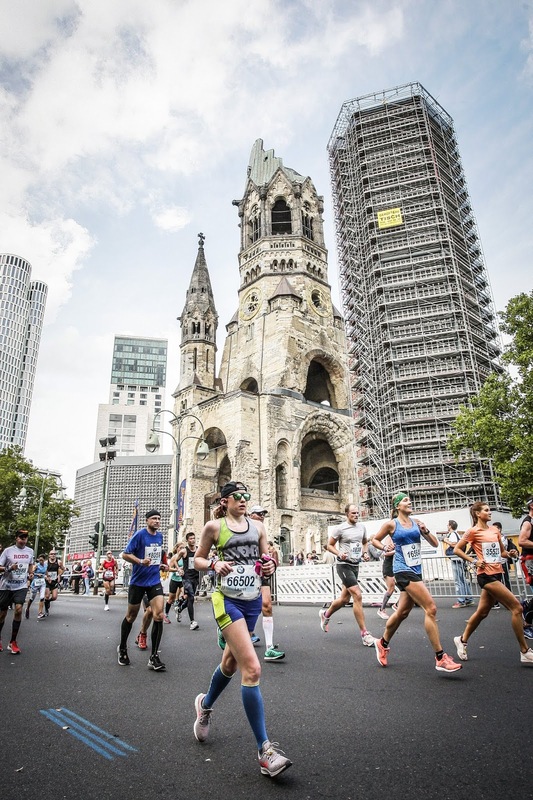 -The race is huge with over 40,000 and energetic. There are always other runners and spectators around! -The race is super international with people all over the world running it. 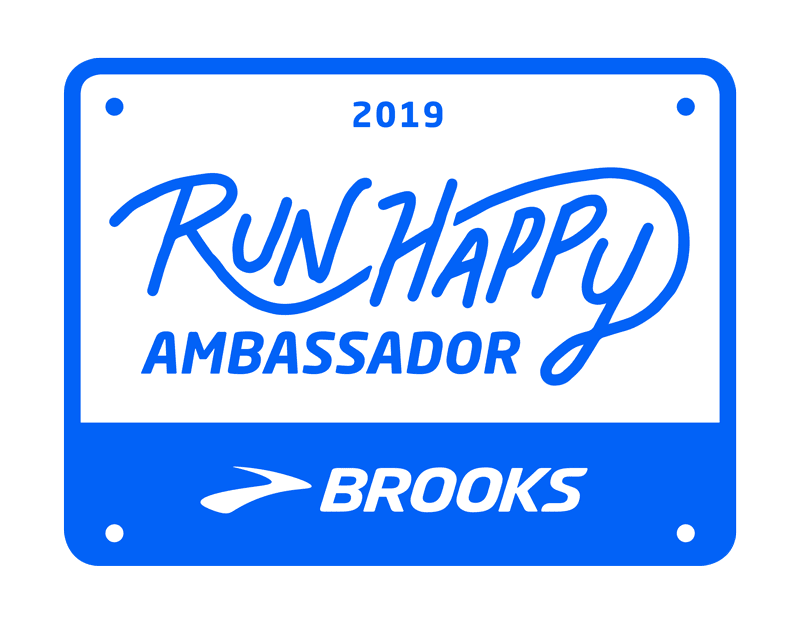 It made for a beautiful running community and experience. 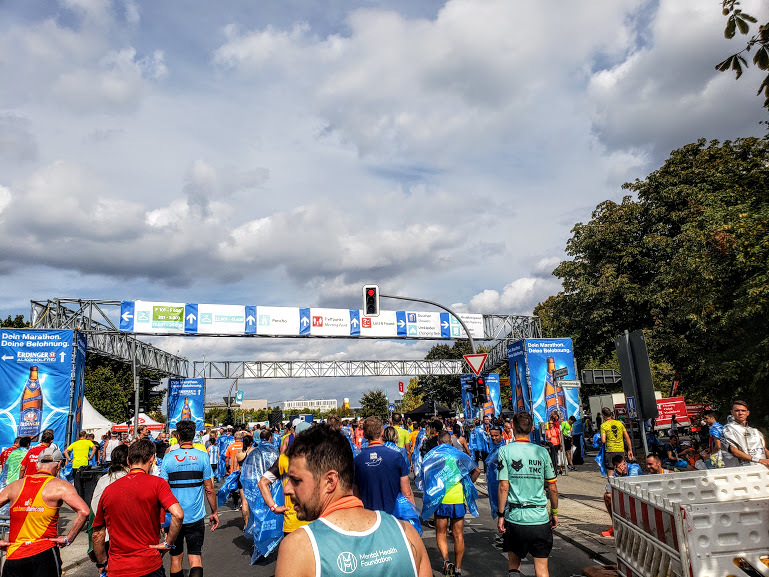 -The course is flat and fast-no wonder many world marathon records including the latest this year by Kipchoge (2:01:39) were set in Berlin! -The races photos looked awesome! 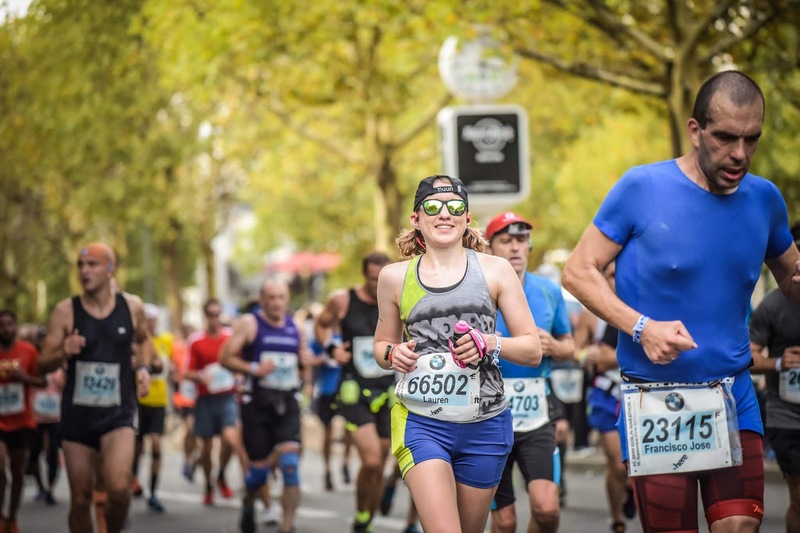 I ended up buying all of them because Sportograf, the photography company offered a deal for downloads of all race photos for only 29.99€! Pretty good deal, especially for a race I may only ever run once. -Oh the plastic cups. The water stops at the Berlin Marathon were horrendous. They were very crowded and bottlenecked but also the race uses plastic cups so the ground was covered with them at the water stops. There was the crunching under my feet and it also made a slippery hazard. I ended up walking a few steps to drink through them. 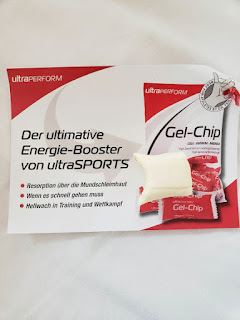 -On course nutrition. Not the usual Gatorade and water from US races, which I know I can handle. It hard to have to carry enough of what you train with/use, especially depending on the weather and where you are travelling from. -It’s a big race. This is partially a good thing but can also be a bad thing. You are surrounded by runners the whole time which can feel crowded, especially if you are used to smaller races. That’s my big ol’ Berlin Marathon race recap. 3/6 World Marathon Majors completed! After a lot of back to back marathon training cycles, I'm ready for the off-season from running and some new goals. 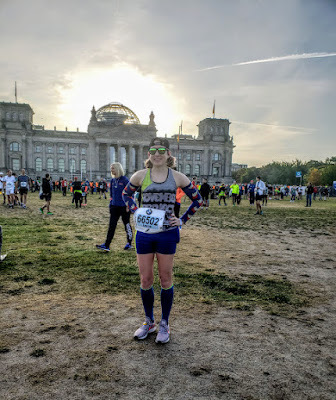 Have you ever run an international race? Have you ever run the Berlin Marathon? As always follow along on Instagram @breathedeeplyandsmile to see what I’m doing in the off-season!